Zarjaz is a 2000AD fanzine, sister publication of Dogbreath. Published in A5 this is an anthology of stories in the same style as its inspiration, 2000AD. Most stories feature character directly from the comic with new story ideas. It is of note that many 2000AD creators have started their comic work with FQP, I’ll write a\ seperate article about that someday. This issue one of the current writers for 2000AD, Al Ewing, has provided a script. The cover artist PJ Holden is a 2000Ad artist and the colourist, Steve Denton, works on publications from other Indie publishers, such as Department of Monsterology from Renegade Arts Entertainment. Artist Jake Lynch on the Chopper story is also a comics professional with work in 2000AD and Judge Dredd Megazine. Don’t ever write of fanzines as ‘just fanzines’. Check out my review of Dogbreath issue 29 to see another example of what I mean. An elderly mutant in the Cursed Earth tells youngsters about when a young stranger stopped by. 3-page story with a great message. The homeliness and purity of the mutants in the story and Chopper coming over very cool. Anthologies are perfect for these kind of stories. 2 pages are all it takes for this long awaited sequel to a series that ran between September of 1985 to September of 1987. I think in some ways you need to lmow the original to fully understand this story. A fun romp (if 2 pages consists a romp and in this case it does) for those that know the references. A passer by stops to talk down a potential suicide leaper. This is so spot on for one of those ‘Judge Dredd light’ stories from 2000AD. Absolutely spot on with the character of the city and Dredd. The art is as good as the plot. Nu-Earth set during the original run of Rogue Trooper. Rogue and his bio-chip companions come across the corpse of a Souther Hopper pilot. It seems they may have strayed in to an area governed by a Nort almost as mythological as Rogue. Again a story with the central themes from the original story fully intact. Rogue was the most human character in his strip, despite being a genetically engineered killer. 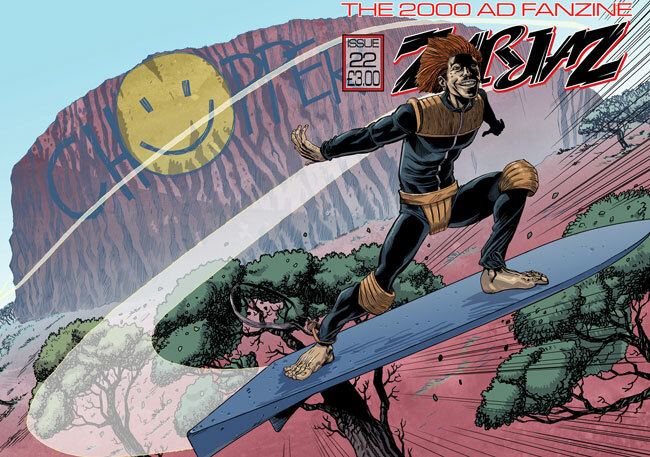 This is a prequel to MACH1, a story that appeared in the first issue of 2000AD and ties in to the story of Shako. 10 pages of action and a good dose of humour. A brilliant tie-in for two unrelated stories (2000AD doesn’t have an integrated universe). The story works great without full knowledge of the two individual stories however if you have read both this is truly brilliant. Tharg rescues a Script Droid from jail, only for the Scripy Droid to insist on dragging along a run down old Art Droid. Abrilliant story giving Bolt-01 the opportunity to stretch his own art droid arms. I must admit I’m not sure who the two droids are… but it is a hoot of a tale! Dredd is on Traffic for a shift partnered with Judge Moodie. Moodie can’t seem to see the point of this duty, could be why Dredd was sent to partner him. Again, sorry to be repetative but it is true, this story is bang on the nail for how the city and Dredd are seen in the pages of 2000AD. Finn, the Post-Celtic eco warrior come taxi driver. His High Priestess is in peril playing a potentially fatal game of chess with their enemy, Lord Courtney. A nice plot for this often over-looked character. This entry was posted in Reviews and tagged 2000AD, Al Ewing, anthology, Comics, fanzine, Sci-Fi, small press.